The Detroit Federation of Teachers’ Contract: The Worst Ever? 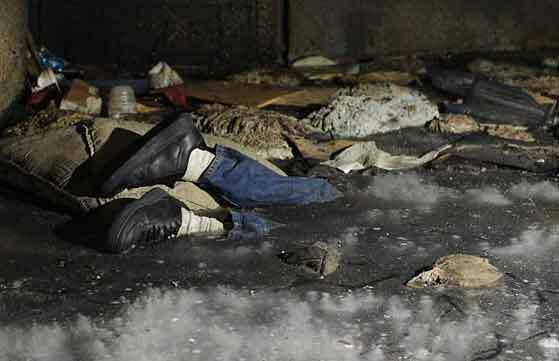 The body of Johnnie Redding, a homeless Detroit man, was found frozen in the ice while young men played hockey nearby. Photo by Detroit News.In early January 2009 in Detroit. The frozen feet of Johnnie Redding were found sticking up out of the ice in the basement of an abandoned building while amateur hockey skaters played around what of him protruded: black tennis shoes, white socks, and the lower edge of denims. But anyone who thought the year 2009 in Detroit couldn't get much worse was not paying attention to Detroit or its public schools. http://richgibson.shutterfly.com/34#28. We will be working to integrate them into the report below over the next three days. George N. Schmidt, Editor, Substance, January 8, 2010]. A Detroit News reporter called 911. It took the typically baffled Detroit police several days to find Johnnie Redding, saw out and thaw his remains, determine his identity as a homeless man, and bury him. 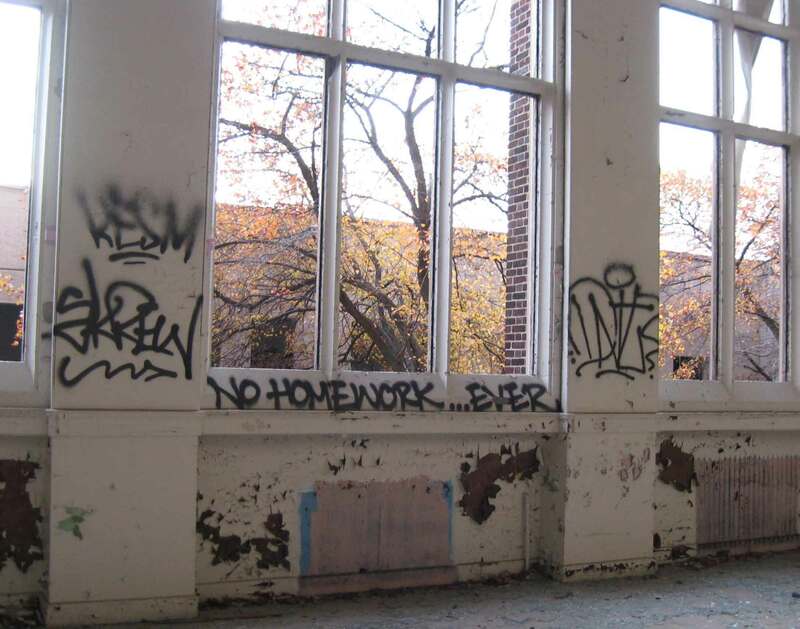 One Detroit public school in 2010. The posts holding up the sign read "I love my school..." Substance photo by Rich Gibson.It’s been a death by a thousand cuts for Detroit, as Redding’s no-so-singular frozen death demonstrates. More than 85% of Detroit’s people are black. It’s the most thoroughly ghettoized city in the US. Two million people once lived in Detroit. The population is now less than 800,000, many of them unable to leave. It’s a mayoral brag that he can bulldoze more than 10,000 vacant homes a year. Detroit houses famously sell for $1,000 on line. Today, 2/3 of Detroit homicides go unsolved. 50% of the city’s adults are jobless, a rate over 70% for youth. 50% of the city’s adults are illiterate. 2/3 of youth never graduate from high school. In December, Detroit scored lower than any city on the national, NAEP, exams. Now, we witness the end of what was once the nation’s finest urban school system, an organized decay that reached its zenith on the last day of school before the winter holiday break. That was the day the Detroit Federation of Teachers leadership counted the votes ratifying what may be the worst teacher contract in US history, ratified by 63% of the DFT members. The tally was 3,578 to 2,031. DFT has nearly 7,200 members, about ½ of its total membership a decade ago. American Federation of Teachers President Randi Weingarten touted the deal in a December 17 ad in the New York Times, describing the debacle as a “covenant” (religion has a firm hold on most Detroiters) that represents a model for progressive teacher contracts, recognizing the unity of educators, administrators, business, and the community. AFT, and every big union leader, rejects the idea that causes most people to join unions: contradictory interests of employees and employers. Weingarten played a key role in the negotiations, as did DFT President, Keith Johnson. Indeed, some insiders claim the bargaining team was unaware of the substance of the deal before it was presented to the rank and file. Detroit Democratic Mayor Dave Bing (yes, basketball) immediately declared the contract to be a model for city workers. And it will become the baseline for many urban school districts. While it may be more important to determine how it was this phantasmagoric sell-out was achieved, rightfully impatient readers will want to know: What price did school workers pay to win this praise from Weingarten? On December 19, the day after the DFT ratification, the Michigan legislature moved to align its school rules with the Obama/Duncan Race to the Top (RaTT) project which parallels the results of the Detroit contract. The Michigan Education Association (a National Education Association affiliate) which represents nearly every district in Michigan other than Detroit reported that working hard in tandem with AFT, they had won some concessions against the RaTT, but were unclear about exactly what they are. MEA did nothing for DFT during the Detroit negotiations, MEA’s racism and opportunism failing to recognize that the Detroit contract is going to appear in from Oak Park to Muskegon to Ishpeming and everywhere in between. An injury to one does go before an injury to all. How could this happen this once fine school district and what was one of the most militant unions in the country? DFT members, more than any other rank and filers, had wildcatted (1999), struck (2006), picketed, protested, faced arrest and firings, for more than a decade. But the schools and the union collapsed as one in December. Racism and greed, profiteering, are surely the external factors that destroyed DPS and DFT. Michigan’s auto industry vanished from Michigan. Auto bosses took jobs to Mexico, where workers earned 10% of their Michigan counterparts, and then on to China where some workers earn 10% of their Mexican counterparts. 200,000 jobs were lost in maquiladora plants in the last five years. The United Auto Workers–whose early battles set up a decent wage system that made Detroit the locus of more single family homes than anywhere in the nation-- took on a series of unconscionable concessions that never saved jobs, but did save pensions for the union leadership. Finally, in the fall of 2009, Ford workers overwhelmingly rejected a concessions deal negotiated by new UAW boss, Bob King, once seen as a militant organizer. King negated the vote and imposed the sell-out anyway. Racist housing covenants segregated Detroit early on, as did bank loans and expressways. While white people fled the city long before the uprisings of 1967, the rebellions sped them along. In the 1980's, the Detroit Chief of Police was arrested when, on a search of his home, a million dollars fell out of the ceiling of his kitchen. He exclaimed, “Wow, where did that come from! ?” In 1999, in a maneuver widely seen by Detroiters as an effort to strip them of the vote, white politicians in Lansing abolished the elected DPS board, replaced it with an appointed board composed of bosses from failed corporations like Chrysler (by then owned by Daimler-Benz which did Buy American...before the company went bankrupt in 2009), figurehead educators like the president of a Catholic College who knew nothing of Detroit, and a coke-head suburban Mom, owner of a Detroit maquiladora, who was afraid to enter the city to attend meetings. She was allowed to attend via cell phone, and her orders to her maid, Lucita, were broadcast in the background. The violent fist behind the velvet glove of schooling was exposed when, at the first Takeover Board meeting, SWAT teams with fully automatic rifles surrounded the location. Snipers were openly posted on roofs. Armed guards escorted the Takeover leaders into the auditorium, passing an armed personnel carrier. In this first meeting, a small group of middle school girls carrying signs protesting the takeover approached a microphone, before the meeting began. The Takeover chair, Freeman Hendrix, who later ran for mayor with so much suburban support he poisoned his own well with white wealth and was defeated, screamed at the Detroit Police riot squad, "Get them! Get them now! Get them out!, They did. The girls were bodily thrown out the door. That set the stage for future meetings, but Detroiters, never ones to quail, routinely disrupted future meetings, shouting down speakers. The Takeover Board accomplished nothing they claimed they would accomplish in more than five years of work. Test scores dropped. The illiteracy rate rose. Students fled the system. But the Takeover Board did refurbish schools, on no-bid contracts to suburban developers, and they built more than a dozen new schools–as more kids left. Today, ten of the new schools sit vacant and completely stripped of everything of value, except books, while the school board spends $1 million a year to fence and protect them. Scrappers steal the fences too. By 2006, the DPS had replaced the failed Takeover Board with an elected board of people, most entirely new to the job. But the city and the schools continued to decay, fast. Mayor Kwame Kilpatrick, elected in his early thirties, spent $200,000 refurbishing the swimming pool in his city owned mansion, partied hard, took on an underling as his mistress, and was convicted of perjury while his salacious text messages to her circulated throughout the city. Kwame, son of an equally incompetent and corrupt state legislator, his mother, was forced out of office in 2009, did some jail time, then moved to Texas where he was given a six figure job by a prominent Detroit businessman. His travails deepened what can only be called a form of mass depression, anger turned inward, among the people of Detroit who elected him, full of hope. Bobb, however, did take advantage of the notorious incompetence and corruption that plagued DPS for decades. He caught hundreds of small time crooks — people who maintained non–relatives on health insurance plans, dippers into school cash boxes, mis-users of publicly owned cars, etc. — but the developers and real estate agents who did the big dirty deals of the last twenty years have, so far, skated. For example, elite Cass Tech High was completely rebuilt, at a cost three times that of similar new schools. The School Board offices moved to the tony Fisher building, paying for five floors about the same cost for what the entire building sold for two years later. DFT kept pace. As the union lost half its members, its leaders bought a new building too–near the Fisher Building. Between 1995 and 2009, DFT hacks foisted concession upon concession on the work force, under the faithless claim that concessions save jobs. They don’t. Between 2003 and 2007, Detroit teachers gave up $63 million in concessions and "loaned the district a week’s pay. The school system turned about and gave administrators raises at 10%, often $10,000. The DFT leadership, which had witnessed the concessions spiral of the last 30 years, feigned shock. 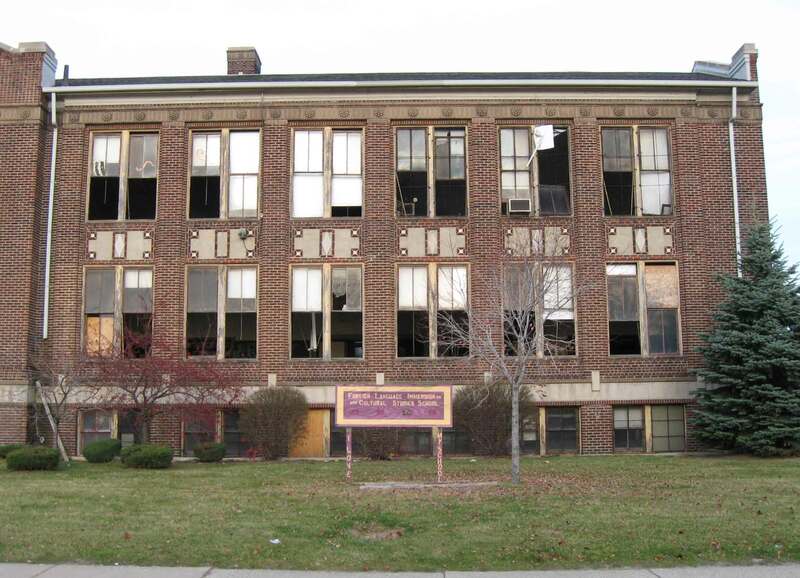 Catching crooks and attacking incompetents played well to Detroit citizens who had grown appalled by the city’s education system–often for good reason. Proof of Bobb’s popularity came in mid-2009 when the voters of the bankrupt city passed a $60 million bond issue, to refurbish old schools and build new ones—again. Bobb’s popularity did little to save DPS enrollment. He spent $500,000 on a campaign to woo students back to DPS, each little body worth a bundle in state dollars. His first move: every school entrance door was painted blue. The slogan: “I’m In!” The official results: 35 more students enrolled in DPS (no student count can be trusted in Detroit, where all involved know they gain from an inflated figure). Bobb initially claimed it would take 65 kids to pay for the campaign. There are now 83,812 kids in DPS, when they show up. Whether or not Bobb gained popularity by hugging the DFT president, Keith Johnson, is an open question. Johnson, a DFT employee since the mid-nineties, easily won election, if that is a measure of his own like ability. Even so, he’s widely mistrusted among at least a sizeable minority of members. The DFT contract was to be finished in August 2009, but Johnson extended it, wiping away the best time for a school based union to strike–opening day — then extended it again as he vanished under a cloud of negotiations secrecy–typical of US unions which don’t like members to see the deal cut in person. Johnson’s few appearances were typically hand in hand with Bobb, promoting one civic or educational venture or another. Then, in December, Johnson announced the contract as a done deal. In a mass meeting in Cobo Hall, about 2000 members shouted, “No! No! No!” But the DFT web site was covered with threats and fear: “· A NO vote means the members reject the Tentative Agreement. · If the Union rejects the “last best offer,” Mr. Bobb can declare “impasse” and move to impose the offer. · The Union can file for fact-finding, however, that would be a futile effort since the facts of the district’s finances are not in dispute. Mr. Bobb’s case would be fortified by the fact that the parties reached a tentative agreement that the rank and file rejected. · The indisputable facts would allow Mr. Bobb to impose the “last best offer” with all of the concessions proposed in it to address the district’s budget deficit. Former DFT presidents going back as far as Mary Ellen Riordan (1960-81) signed letters urging ratification. Johnson said that rejecting the contract would destroy the DFT. Recall the past militance of the DFT rank and file. Why, this time, was their response so different. Why cave? Why not force Johnson back to the table? Why believe the lies that Bobb and Johnson fabricated together? I interviewed or received emails from 110 DPS educators, counselors, and others, in both elite schools like Cass and what are called “neighborhood schools,” some of them failing completely, others succeeding to one degree or another. Days after the ratification, Steve Conn, a long-time activist who had been fired by the district and only won his job back with a lawsuit, announced a recall campaign against Keith Johnson. 1,000 people quickly signed a petition. A recall would only put the DFT Vice President in office, but many people believe a solid slap in the face, and return to the classroom, would be exhilarating for DFT members. *Prepared for Freedom Schooling for kids, demonstrating why things are as they are within an economic system that requires inequality, exploitation, racism, nationalism and irrationalism and countering the real need many parents have for baby-sitting. *Demanded, in real terms, Books! Supplies! True Caps for Lower Class Size! *No wage or benefit cuts, but increases to make up for past losses, and against projected inflation. *MEA could have been enlisted, at least with a Solidarity Demonstration, a mass march of suburban headed north and south on Woodward, meeting at the Eight Mile Fairgrounds for a mass rally. *Repeatedly demonstrated the direct connections between capitalism, imperialism, war, curricula regimentation, high-stakes tests, racism, and the destruction of civil life in the city. To prepare for a strike, it would have been important to carry a door-to-door, person to person, campaign, a plan to establish freedom schools for people who not only are desperate for the free baby-sitting service provide to corporations which refuse to offer it to employees, but people who truly want their kids to learn something of significant, something that will help them learn how to understand and change the world----something that is offered in nearly no schools now. The DFT could have easily set up an online bulletin board, for educators and perhaps others to discuss events of the strike, to make suggestions, to see the commonality of their problems and to plan action. But no union runs such a bulletin board. Members talking to each other can be critical, and thus dangerous. This, DFT did not do. And NEA members as well as AFT members can expect their Quisling behavior to appear everywhere. And what can be done? So, what is up with all this anyway? The education agenda is a war agenda, a class(room) war agenda. Schools are the centripetal organizing point of de-industrialized North American life (and elsewhere too). The struggles in schools mesh ideology and money; sometimes colliding, other times in a perfect marriage. Any society engaged in militarism, imperialism, tied to a consumer economy, would surely move to greater control over what citizens know and how they come to know it. Schools would be key. 1. Regimented national curricula ( the history standards as a model). 2. Anti-working class, racist, high-stakes tests. 3. Merit pay linked to the tests. 5. Some privatization (Detroit charters are public, now). 6. A full blown assault on educators’ wages and benefits. K12 teachers could be traveling adjuncts soon. While retreat appears to be the main move from workers today, as with the horrific DPS and Ford contracts, events in California, initiated by students seizing buildings in opposition to education cuts, are heartening. A national call for a March 4th strike circulates now. It’s a good start. Over time, people will fight back, as they must fight back to live. At issue is whether people will make sense of the reasons for the need to resist, i.e., the central role of the system of capital (exploitation) and its twin, imperialism (raw materials, cheap labor, markets, regional control, that is, war) and win; or whether people will try to fight back one by one, job sector by job sector, and lose, piece by piece. The core issue of our time is the rapid rise of color-coded social and economic inequality and the promise of perpetual war, challenged by the potential of mass, class-conscious, resistance. Will we win? The best news is: we do not know. We might if we form trusting communities of care and resistance. If we do not, we can wind up alone disappearing like Johnnie Redding. It is a choice. Community or barbarism. [Dr Rich Gibson lived in Detroit most of his adult life; most of that at Seven Mile and the Lodge. He taught at Wayne State University until 2000 when he moved to San Diego State as an Associate Professor. He is a co-founder of the Rouge Forum. He can be reached at: rgibson@pipeline.com].